It happens every year, the clamor for pumpkin treats: pie, cupcakes, pancakes, muffins. Eli, particularly, adores all things pumpkin and thinks it’s quite reasonable to expect a pumpkin pie for dessert an hour after we return from the pumpkin patch. Well, maybe so, but not with the new pumpkins, certainly. In fact, you all probably know this already but it bears repeating: you don’t want a Jack-o-lantern pumpkin for pie and really, you don’t even need pumpkin (shh!). Roast an acorn squash with a cinnamon stick and some cloves, even a knob of fresh ginger, stuck in the cavity, take out the flavorings when the squash is tender, scoop it out of the skin, puree, and then proceed with your recipe as if it were pumpkin. Really, nobody will ever know the difference. 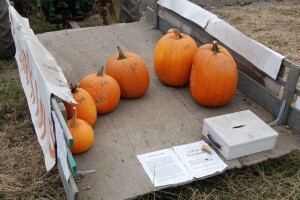 But still, we go to the pumpkin patch every year, because what’s October without pumpkins? 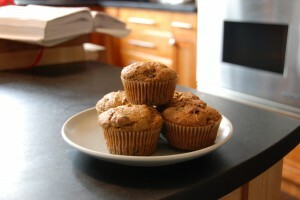 And when we are home from the pumpkin patch, one of our favorite quick pumpkin recipes is for muffins. And mix well. Now add the flour mixture to the pumpkin mixture in three parts, alternating with the milk mixture. Stir just until combined. Then add, if you like, chopped walnuts, raisins, or chocolate chips (about 1/2 c each). Bake in a muffin tin for 30 minutes, or until a tester comes out clean. Looks like a great recipe. I love all things pumpkin. I made a pumpkin risotto with half a pumpkin and now have the other half waiting to be eaten, so maybe I will turn it into muffins. Oops! Yes, 350. Just edited the recipe to reflect that.